Is pro surfing a dead-end career? Most of my friends are, or once were, professional surfers. I was born and raised in Santa Cruz and, given that I am a part of this tight-knit community, it’s highly uncomfortable and difficult for me to write about the harsh realities that I see some of these surfers facing today. That being said, I will continue on as honestly as possible—because pro surfing isn’t always the glamorous career it can seem. The definition of “pro surfer” will vary depending on whom you ask. 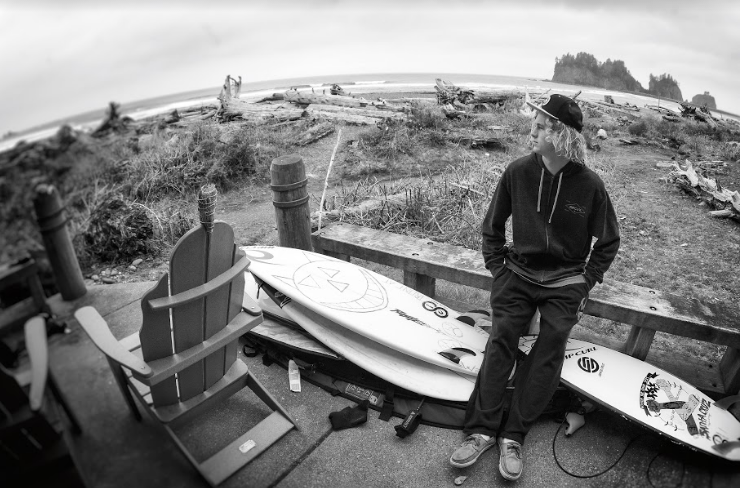 Some people will tell you that Nat Young is the only pro surfer in Santa Cruz because he is the only one who competes on the World Surf League (WSL) tour. To gain clarity on the definition, I ride my bike to Pete Mel’s surf shop, Freeline. Mel won the Mavericks competition in 2013 and is one of the most celebrated surfers to ever come out of Santa Cruz. “A pro surfer is someone who gets paid to create value for a brand by surfing and getting media attention,” he tells me. Right now, I am one of the few surfers in Santa Cruz who still enjoys a small salary from my main sponsor, Patagonia. If my friends were to be brutally honest, they would tell me that dozens of unsponsored guys in town surf circles around me. They would tell me that I have never been paid for my surfing, and that, in reality, I get paid to create video content that aligns with my sponsor’s brand. Thankfully, my friends are too polite to tell me any of this, so I’ll go on introducing myself as a pro surfer, although it is unclear sometimes why I really get paid. Three-time Mavericks champion “Flea” Virostko enjoys a clean barrel at a secret spot close to home. Young’s job is clearer: win the heat. The athleticism and grit that it takes to compete on the WSL are freakish attributes that very few surfers from our town have ever possessed. Unlike a free-surfer who tends to have a more wanderlust schedule, chasing swells wherever they go, Young’s year is mapped out in advance as he moves from competition to competition. This also allows Young to gain income from both competition prize money as well as sponsorship endorsements. Free-surfers rely strictly on sponsors. I’d say that about 90 percent of pros to ever hail from Santa Cruz, including Mel, were primarily paid as free-surfers. Not unlike a professional model, a free-surfer gets paid to promote the products their sponsors are trying to sell. They do this by garnering media attention while sporting their logos. Noah Wegrich on a road trip through California with photographer Dylan Gorden an fellow pro surfer Hank Gaskell. The simple truth is that whether you are Young, Mel, or a grom who gets paid $300 per month, a pro surfer is a commodity. The moment the athlete is no longer seen as someone who moves product, they will no longer be paid to surf. The reasons a pro might get dropped by their sponsor can range from image to age to number of Instagram followers. It’s been at least 10 years since the industry began shifting funds away from the local pro to invest more in the top guys. Santa Cruz used to have dozens of athletes who made good money to surf. Some of them included Jason “Ratboy” Collins, Darryl “Flea” Virostko, Shawn “Barney” Barron, Adam Replogle, Ken “Skindog” Collins, Josh Mulcoy, Anthony Ruffo, Bud Freitas, and Mel. Today, I can count everyone who gets a paycheck on one hand. With powerful layback turns like this, former pro Adam Replogle was one of the few surfers from Santa Cruz to qualify on the World Surf League. This creativity can take shape in the form of a YouTube series, a clever Instagram campaign, or having an irreplaceable “personal brand.” A good example of this originality is Mark Healey, a big-wave surfer, professional spear-fisherman, and Hollywood stuntman. Then again, you could make this argument for any model, athlete, writer, or content producer today—they all need to be more creative than the generation prior. So, what makes the industry of professional surfing even more isolating for its participants? The first harsh reality that pro surfers face once their careers wind down is that very few of them are college educated. Unlike basketball and football, there is no organizational structure that encourages surfers to develop their minds in conjunction with building their careers as professional athletes. This lack of education leaves a lot of pros excluded from certain tables once their athletic careers come to a close. Bud Freitas is known for his smooth style and powerful turns. 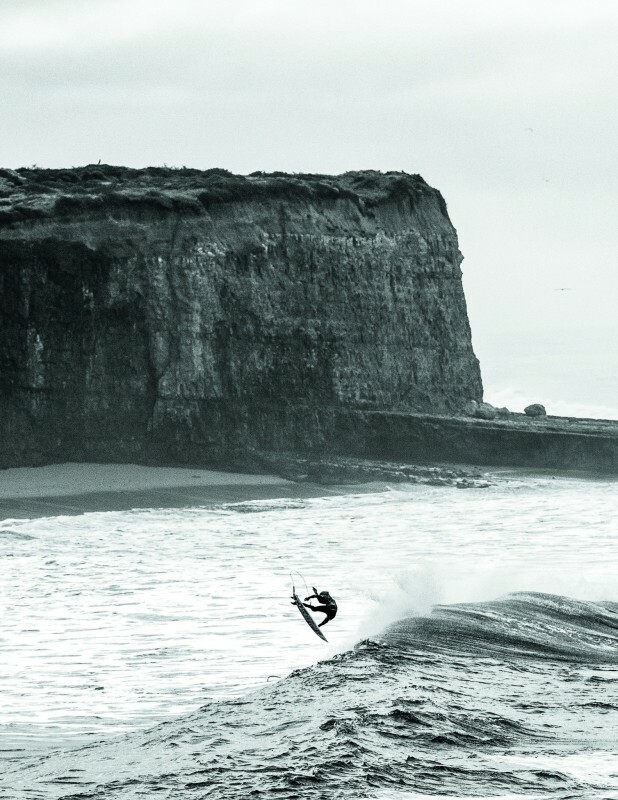 Although he is no longer a pro, he is still one of the best surfers to ever come out of Santa Cruz. The good news for today’s surfers is that they have more computing power in their pockets than NASA did in 1969. Given the amount of travel time pros have, they can pursue a DIY education with virtual tools. WSL pro surfer Conner Coffin, for example, took online courses and received a college degree while qualifying for the tour. The second harsh reality that I see pro surfers struggle with after the spotlight fades is the identity crisis. Introducing yourself as a pro surfer can be a difficult habit to let go of, especially if it’s been getting you dates and free yoga classes for the last 10 years. Even when the writing is on the wall, it’s common for a pro to clutch to the false dream that one day they will “make it.” This isn’t entirely their fault. As former pro Bud Freitas told me, “Team managers fill your head with false promises and tell you that you’re going to be the next big thing.” As a result, many pro surfers miss opportunities that could allow them to gain valuable skills applicable beyond the world of surfing. Our society values glamour and prestige to an absurd degree. It’s an ego blow for anyone in any career to feel like they’re moving backward, but it’s especially jarring for a professional athlete who gets dropped by their sponsor and has no backup plan. Being a pro surfer who travels to exotic locations for nine months a year and then wakes up one day and realizes that they’re an unemployed 35 year old with little work experience can be a shocking life adjustment. Nat Young walks up the beach to a post-heat interview at Pipeline. In a larger sport such as golf, even a mediocre pro may have millions in the bank once their career ends. 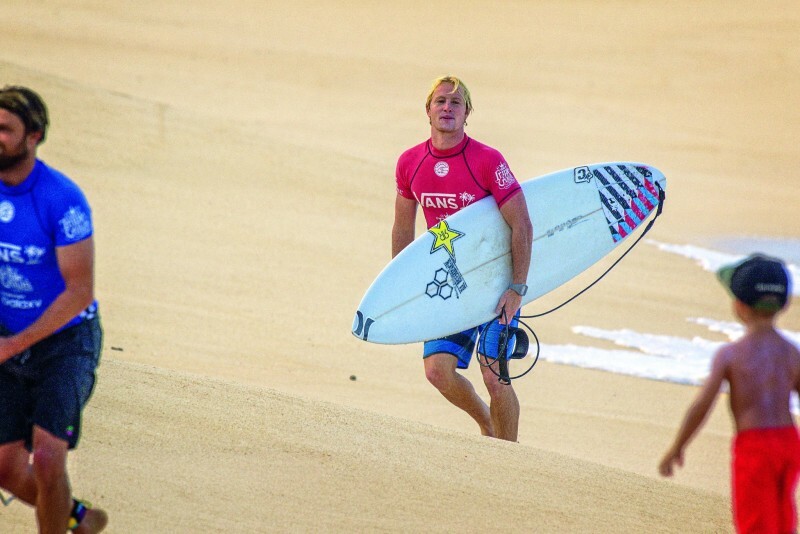 A mid-tier pro surfer, however, usually must get a new job shortly after their career ends. In 2016, Kanoa Igarashi finished 20th on the WSL and earned $157,250. In same year, golfer Gary Woodland finished 20th on the PGA Tour and earned $2,137,482. These figures exclude endorsements which, when factored in, generally widen the earning gap between surfers and golfers even further. Standout teen Santiago Hart with a relaxed style and logos blazing. The third, and darkest, reality for some pro surfers is addiction. There are endless reasons why athletes turn to drugs, but this tragedy has left an inordinate amount of this town’s most talented surfers homeless or in jail. Thankfully, addiction is less prolific among the younger generation of surfers in Santa Cruz today. Mel struggled with drug addiction in the later part of his career as a pro, but is now many years sober and represents a shining light of someone who has made a successful transition out of pro surfing. He travels the world as a WSL broadcaster, and while home, he runs Freeline with his father John Mel and wife Tara Mel. As a commentator for the WSL, Peter Mel travels to locations such as Teahupoo (pictured here) with the best surfers on earth. “I mixed the two for years [broadcasting and surfing],” Mel says of how he prepped for post-pro life. 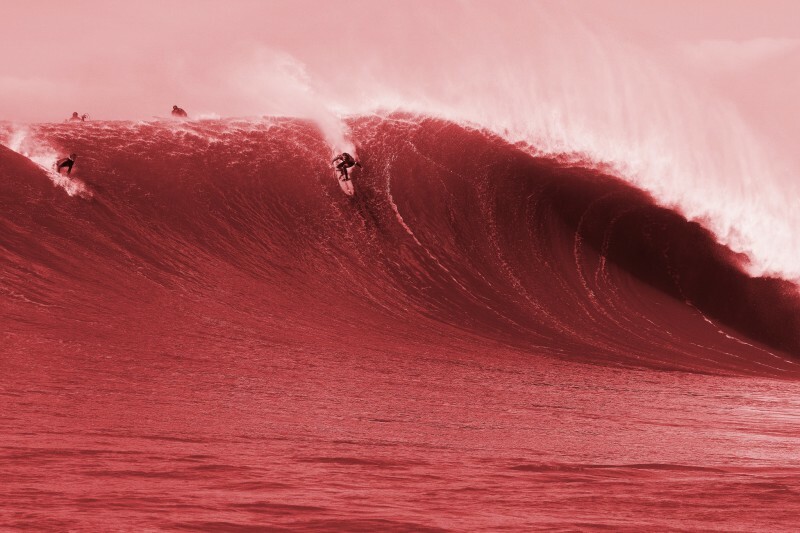 “I piled my plate and said ‘yes’ to every opportunity that came my way.” When, at age 40, his career began to swing more toward broadcasting than pro surfing, he had a solid foundation to make the transition. I respect this quality about Mel. He’s not bitter, or entitled, or afraid to learn new skills. Paradoxically, because he sought out less glamorous work as his pro career ended, he is now more recognizable than many pro surfers through the millions of people he reaches as an on-camera correspondent for the WSL. A few days after my conversation with Mel, I sit down with Noah Wegrich at New Leaf Community Market on 41st Avenue. With two-page spreads in SURFER Magazine and a recent short film called Mr. Good Times about his trip to Indonesia, the 23-year-old aerial specialist has become one of the most talked-about surfers in town. He is also one of the few who gets paid. “Where have you been recently?” I ask. Noah Wegrich globe-trotting to places unknown. Even for someone like Wegrich, who is seemingly doing all of the right things, money doesn’t come as easily as it did for the last generation. “Most people don’t know this, but when I’m home I do landscape architecture with my dad, then I usually spend that money when I’m traveling,” he explains. Noah demonstrates a patented front-side air reverse somewhere close to home. Although Wegrich didn’t go to college, I don’t worry about him. He has a naturally curious mind, and, like Mel, he’s not too proud to get his hands dirty and learn new skills. For now, though, he remains focused on surfing. His current goal? “I want to get a 30-second barrel at Skeleton Bay in Namibia,” he says. He’s been honest and open with me. I thank him for his time and wish him luck. As I get on my bike to ride away, I text him a good psychology podcast to listen to on his upcoming travels. MORE PHOTOS IN AUG/SEPT MAG ISSUE! This entry was posted in Featured, Local Loop, Opinion, Spotlight, Surfing. Bookmark the permalink. Nice. Good read. There I was at Santa Monica High School not realizing I would later be recognized as the ‘first’ PRO skateboarder as the recipient of free product and sponsored travel from Makaha Skateboards. The value was realized later when working in the Action Sports world. (Kyle, say ‘Hi’ to Eric for me). nice article!! pro surfing in general doesn’t equate to big money..but money aint everything! life experiences are! !